This is a question I get a lot – and for good reason. Most people get their businesses started going as a side gig, so they have to manage their time & energy for their “day job” and their business at the same time, without letting either suffer; and if you’re running a service based business, once it’s churning along semi-smoothly, you then have to balance your attention between handling client work (which pays the bills now) and taking care of your business (which, if neglected, means you won’t be able to pay the bills in a month or three). In that meantime, I’ve tried a myriad of ways to balance these projects without taking too much away from any of them. Some tactics have been more successful than others…and at the moment, I’ve got some that’ve been working well. Can I guarantee it’ll work for you? Nope, but if you’ve had that feeling of too many plates spinning at once (and the really unpleasant feeling when one of them shatters), it can’t hurt to take a look. Assigning categories to each day of the week. This way, I get to stay in the same mental ballpark the whole day, without any drastic shifts, which allows me to get into a really good groove. (Which, it is not an exagerration to say, exponentially increases my productivity.) My loose categories are as follows: Mondays are admin days for my business, Tuesdays & Thursdays are client days, Wednesdays are mostly content creation, and Fridays are biz-dev days for my business. Aiming for scheduling appointments either at the beginning or towards the end of the work day. Obviously, if mid-day is the only time that works for someone, I can & will schedule an appointment for then; but in general I try to put appointments in either 9 AM or 10 AM time-slots or after 2 PM. This way I can make sure I have a solid swathe of time to work without being interrupted by appointments for the bulk of my work day. 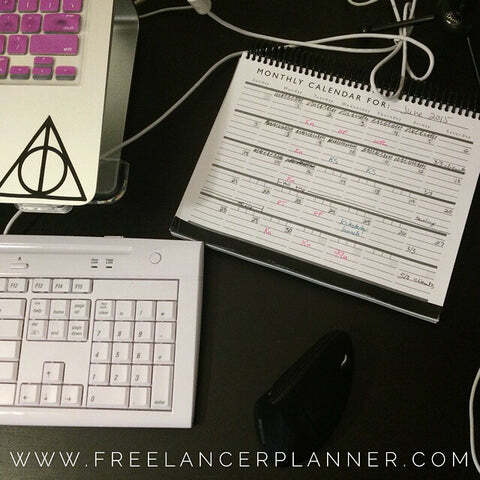 And I try to schedule appointments roughly corresponding with the categories – coaching or consulting for me goes on Fridays or Mondays, client appointments are usually Tuesdays & Thursdays though sometimes Wednesdays. Having a color-coded task list/calendar. This is probably the quirkiest item on the list, but having things color coded by client makes it incredibly easy to see at a glance if I’m spending the bulk of my time on one thing and possibly neglecting others. If my task list looks more like a rainbow across the week, I’m doing it right. Trying to work on multiple different big projects in one day. For example, splitting up one day between biz-dev & client work. It’s too big of a mindset shift for me and I end up making a lot of progress on one project and doing absolutely nothing on the other one. Not making a distinction between work on my business & work in my business. Two entirely different things that require two wildly different mindsets and viewpoints. Working on my business (or your business) requires a really top-level, bird’s eye view; working in my business means taking more of a day-to-day, detail-oriented view. Learning the difference between those two mindsets was huge for me, because it meant I wasn’t wasting time trying to switch directly from one to another. Now, I know that trying to plan those two activities back to back won’t work & ends up more frustrating than anything else. Attempting to split equally time-wise. Far more important than time spent is energy spent, and also important is if I’m actually feeling the project. If everything’s going well, I can get more done in 15 minutes than I’ve got done in an hour other times, so I don’t worry about dividing time up equally between important areas any more, I just make sure I’m moving forward on all of them. There’s a lesson here – despite all of the productivity “rules”, sometimes you just have to do things by trial and error. What works for me might not work for you – sometimes I even break the golden productivity rule and *gasp* multi-task, though only when doing certain things on certain days. Sometimes listening to music makes me more productive, but only when I’m working on certain things, and only certain kinds of music. If you don’t feel like something is working for you, feel free to scrap it and try something else – even if it runs counter to traditional wisdom. What about you? Do you have any specific tricks for working on multiple projects at the same time, without dropping the ball on any of them? Is there anything you do that makes you far more productive that goes against the usual productivity advice? I’m trying really hard to work out a system for myself as we speak (type). I wish I were an awesome programmer because then I would just make my own productivity app! I’m actually thinking of splitting up my days as an experiment, with more creative pursuits happening on some days, upkeep and maintenance and the like happening on others, and personal stuff happening on still others. So, breaking tasks into days based on the sort of task that they are rather than what they’re related to. However, if that doesn’t turn out to be ideal, I’m totally trying your approach! BTW, any chance you would add images to your posts? I keep wanting to pin the darned things onto my blog/biz and personal resources boards, but there is nothing to pin! Amazing!! I’m extra excited because I think we’re similarly obsessed with color coding, so I know whatever you have a hand in will be pretty AND functional. I’ll definitely stay tuned…though I would have done that anyway 🙂 I can just feel the productivity coming in waves off of your site, which I totally need. I will report back on my new organization system. I’m hoping to start playing with it next week. These are some great tips and strategies and *thank you* for sharing what didn’t work for you, also! I’m still in recovery from 25 years as an admin and having to follow a rigid schedule, so I still have an extremely loosey-goosey approach to productivity. I’m also kind of on-call for my #1 client and because he’s my husband and has a flexible schedule, our personal life is kind of on-call. At the moment, this is working well. As time goes on I can totally see needing to schedule my days more effectively. I lay out my week similar to yours- I only book clients T,W,Th from 10-5. I keep Mondays and Fridays for biz building meetings, wrapping stuff up and writing. I like your explanation of the difference between working on your biz or in it. I never really understood that till right now. Thanks! I always love your tips on what does work but I think that the tips on what has not worked were super helpful too! Especially the distinction between working in your business as opposed to on it-like that could be an entire post in and of itself! You offer some really sound, good advice. I can so see you doing the color coding thing (love the graphic, btw), but that is so not me. I’d get all caught up in THAT instead of doing the damned project! One thing I habituated from my Real Estate career was to not schedule appointments on Mondays. Mondays are catch up and in-office days for me. Works great. So glad to hear so many of you have specific days to see work with clients, I am launching more counSOULing sessions and wanted to limit my days, always nice to hear that it works for others. To-so list at the beginning of the week, and a 3 major goal list. My week is over when I have accomplished all of the items, so it’s up to me how long my week is and that works for me. Wonderful tips and ideas. What I began doing last year was splitting up the days I worked with clients vs. the days I worked on marketing. For some reason it opened up a huge amount of time so I can easily get things done. I agree there are some things that are too hard to shift into doing one minute to the next and I find that when I’m in the zone with clients and only focus on that for a few days it works MUCH better than sprinkling them throughout the week. ? Fantastic tips! I’m definitely struggling with multiple projects, and I only get piecemeal hours in a day to do it. (5-6am before the family wakes up; sometimes 9-12 if the kids are in preschool; usually 1:30-3 if they nap well, yadda yadda….) So, it’s really hard for me to move forward on stuff. Dividing the work by day wouldn’t cut it for me, but I like the idea of dedicating a chunk of time to a category of work so I’ll try that with my daily work periods. yes yes yes… I too have found the same kinds of solutions helpful Michelle! I clump certain things into times of days or specific days.. it feels very grounding and calming.. LIke our grandmothers used to do Wednesday was Wash Day.. or something like that.. I also block off my first hours for the Daily Essentials for myself.. meditation and workouts and the things that are foundational to my wellbeing. just don’t even give those times as options to clients or anyone else. Creating structure has become something I love versus what I used to rebel against. And I tend to work in very focused chunks. and then need to unhook for a bit.. Wonderful article and ideas. Great piece, Michelle. I’ve had success with chunking my schedule – so much so that it’s one of the few strategies I recommend across the board, for everyone. Interestingly, I did find that daily activities on each project moved me closer to the goals, as opposed to a strictly day-specific approach. I think that just illustrates that productivity – the ability to PRODUCE, after all – depends on highly individual preferences and circumstances.